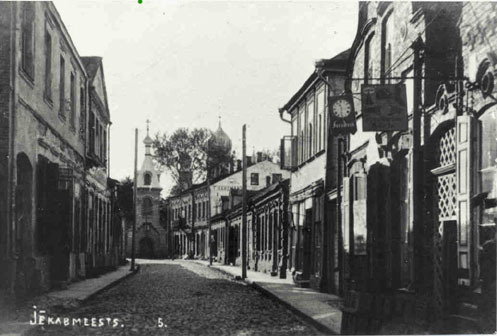 Prior to the 1917 Russian revolution, Kreutzburg (Krustpils), a small shtetl, was located in the Latvian part of the Pale of Settlement and Jekabpils, a large town, was outside the Pale. They were separated by the Daugava River. Jekabpils fell under Courland and Krustspils under Vitebsk. After 1917, the Pale was done away with and Kreutzburg (Krustpils) became part of Jekabpils. 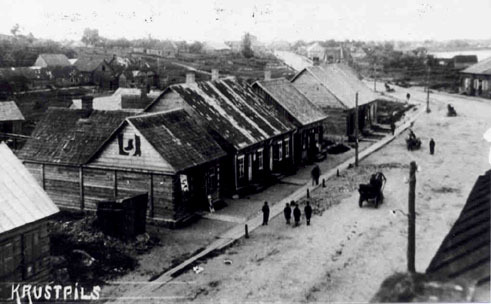 Prior to the Holocaust 25% of the population of Krustpils were Jewish. Today, there are no Jews in Krustpils. Photos or other articles of interest to Krustspils researchers should be sent to me Arlene Beare. Photos must be in jpg format and 72dpi. For publication of a photo on the page you must obtain written permission from any living person. Howard Margol has made this escellent contribution to the Jekabpils/Krustspils webpage. He wrote -As the result of a 1993 visit to Kreutzburg, we found my wife's 1st and 2nd cousins living in Jekabpils. We have made several additional trips to Jekabpils since. We have several photographs that were taken in Kreutzburg during the 1920's/1930's showing the main streets, shops, etc. The photos he sent are shown below. 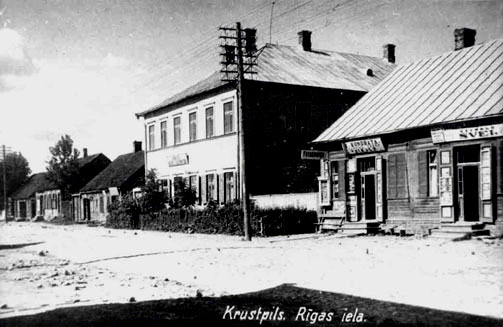 This photo of Rigas iela (street) in Krustpils was taken in the 1920's. All of the houses in the photo were Jewish homes. The first house on the left is a Jewish house and also a photography shop. The two-story building on the left is a Jewish owned hotel. The 2 story building was a Latvian School. To the left of the school building is several wooden houses. In the first one next to the school lived Doctor Manishevitz, a dentist. In the next house lived Yossel Yoffee. In Latvia, and in Lithuania, the Jewish houses had the front door close to the street. The reason was, while they lived in the house it also served as their shop or store. The gentile houses had their front door on the side of the house with plants, flowers, etc. between the house and the street. This photo was taken in the early 1900's. The building on the left was a Jewish shoemaker. On the side of the building, you can see the pictures of shoes and boots. Attached to the front of the building is a small sign with pictures of shoes on it. To the left of the building is what appears to be a public outhouse (toilet). Along the walkway in front of the buildings are hitching posts for horses. Individuals and horse drawn wagons are in the street. In the extreme upper right hand corner can be seen the Daugava River separating KRUSTPILS from JEKABPILS.